If you have been paying attention to the news and notes around the NFL, you probably read or heard that New England Patriots QB Tom Brady reached a significant milestone last weekend: With the Pats 26-10 win over the Rams, Brady won his 201st game (regular season and playoffs) giving him the most wins by a QB. He surpassed Peyton Manning who had won 200 games (186 regular season and 14 post-season). At the other end of the spectrum, there are six QBs who lost 100 of more games in their career. Topping the list is Vinny Testaverde who lost 123 regular season games. Here are the six QBs who have 100 or more regular season losses. There’s a chance that another QB will be joining the above list this season. 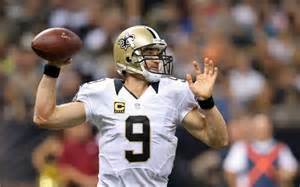 New Orleans Saints signal-caller Drew Brees has 99 career losses and would wander into the 100-loss club if the Saints lose one of their four remaining contests (that’s, of course, if Brees is the starting QB in those games, which he will probably be unless there is an injury). There are five active QBs who have 70 or more career losses. They are: Brees (99), Eli Manning (90), Carson Palmer (82), Philip Rivers (75) and Jay Cutler (71).